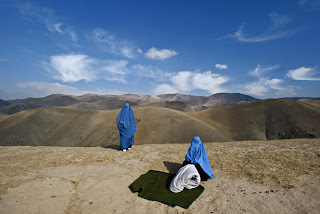 "Afghan women suffer under the constraints of tribalism, poverty, and war. Now they are starting to fight for a just life." The December issue of National Geographic has given the public a new insight into the plight of women in Afghanistan with a series of photo and commentary by award-winning photojournalist Lynsey Addario. The photos include a rare image of an Afghan wedding of which Addario says, "The sober expression on his wife's face reflects the fact that marriage is an enormous milestone in an Afghan woman's life, not just a celebratory event." Another more disturbing image depicts 11-year-old Fariba who, "took the bottle of petrol and burned myself." Although her reasons for doing so are unclear, Addario says that "many Afghan women burn themselves because they believe suicide is the only escape from abusive marriage, abusive family members, poverty, or the stress of war." An accompanying essay by Elizabeth Rubin mentions a collection of "landays," short two-line poems. The book is titled, "Suicide and Song." It is appropriately named, wrote it's author Sayd Bahodine Majrouh, because these two acts are how women protest their anguish. An estimated 2,300 women or girls attempt suicide each year. Some choose self-immolation -- burning themselves -- while others choose poison. Rubin makes an important point by asking, " ... which Afghans in this society are committing the violence? There are significant differences between the Hazaras, Tajiks, Uzbeks, and Pashtuns (ethnic groups from various parts of Afghanistan.)" In asking that question, Rubin raises an important aspect of global feminism: We must take differences into consideration in order to help these women negotiate their societal constraints -- regardless of our personal feelings -- and bring about change. My favorite photo from the collection is this one titled "Daring to Drive." "Even in relatively progressive Kabul," Addario says, "men and women glare, honk and scream at her. It provokes men in Afghanistan to see strong women. It symbolizes a freedom they just aren't comfortable with." Check out the video "Daring to Drive" at NationalGeographic.com and watch the reactions. Take a look at "Veiled Rebellion" -- whether in print or online. Some images are beautiful, others are horrific -- but all are truthful.